Robots In Disguise continues its merry march to baffle consumers and retailers with a pointless array of Legends scale, Quick Change, 3-Step Change and huge Legends-a-like Leader Class lumps. All of which leaves the 'proper' Warrior Class (Deluxe) toys lost in the middle of this kaleidoscope of crap. Thunderhoof has been available as one of those baby-toy 1-Step/Quick Change/'I don't know what but it looks rubbish' toys for about a year, but it's the Deluxe version I've been holding out for, as y'know, I like being able to transform the thing myself. It gives me a sense of achievement and validates my life. Plus, those quick change things look awful in robot mode, with fused limbs and jutting kibble all over the place. And there's no way I'm paying the best part of �10 for a farty Legends toy. I've had enough of that with the Combiners Wars line, thank you very much. 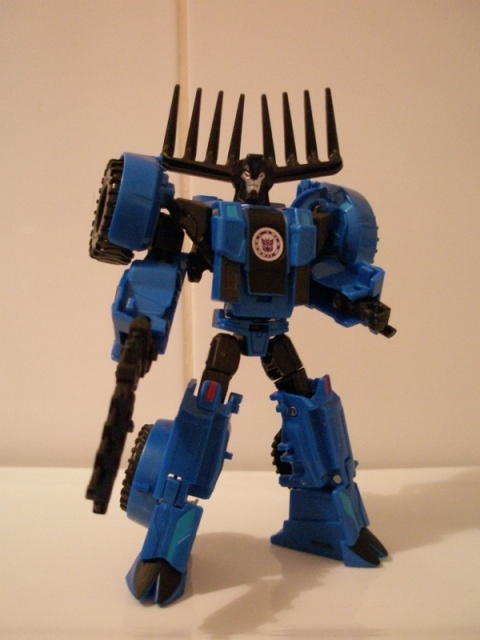 Thunderhoof had an immediately striking design, all outta space reindeer looking ready to mess you up. His character is basically Goodfellas in space. It works well and makes for an interesting character, and one of the more memorable bad guys out there. Don't know how gangster turning into a tractor with a plough is, unless he's running some kind of counterfeit potato operation. Maybe he's just taking advantage of the EU subsidies available for farming, like a lot of the 'slipper farmers' we have over here. Robot Mode: Thunderhoof is quite lithe in robot mode and is nicely proportioned. He looks pretty powerful too, just the way he stands naturally. That illusion is destroyed a little from some angles though, as like Prime Knock Out, his torso is just a tabbard on some axles. The sculpting is nice though, the plastics are solid and the chunky shapes that cover him make him good to handle - if that doesn't sound too weird. The things that make him stand out are the animal based touches � his whopping great antlers and those awesome hooves (which Hasbro have thankfully painted up). His face is also great, carrying over the Prime 'mean and noseless' look. Paint apps are the usual thin on the ground which does make him look a bit plain. There's just the odd spots of some azure and red daubed on. Its fine, and the mix of black and blue plastic keeps things interesting, but he really misses the silver trim of both his animation model and his Legends toy. I like the design of his gun too, which looks like a jagged shotgun. It is a bit flat though, and rendered all in black, it looks like he's waving an aggressive comb about. It's difficult to have this look particularly good pointing it at anyone. One thing I do like though, is that in Beast Wars fashion, he can store this on his back � the storage port for his vehicle mode still being accessible in robot mode. 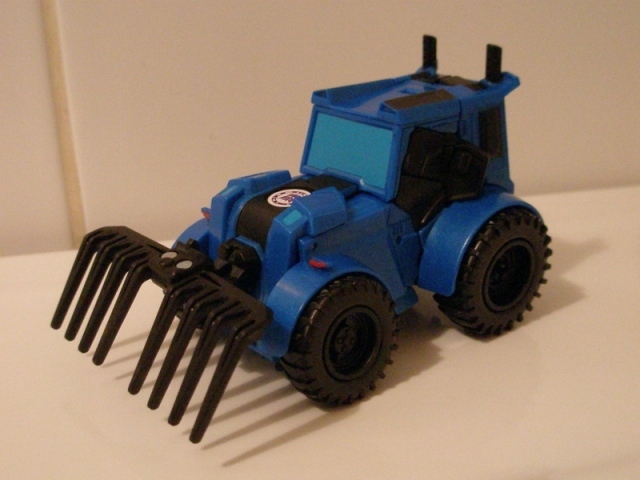 Alternate Mode: The tractor mode is nice, all compact and boxy, and I like how the antlers are used to form a plough on the front. It looks good, but as with all the RID toys, just looks very plain. The paint apps which are fairly noticeable in robot mode are just lost against the sea of blue here. It's a good chunky little toy thing though, and despite looking a bit Playskool, its nice to see some less obvious alt modes creeping into Transformers.